Kevin Durant is trying to move on from his altercation with Draymond Green and the Golden State Warriors star said it would have no impact on his free agency. 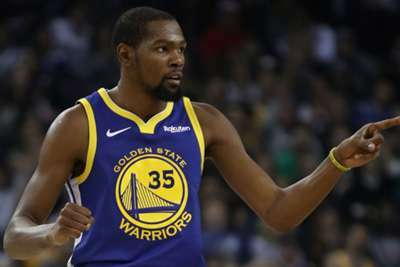 Green and Durant were involved in a heated verbal exchange during the team's matchup with the Los Angeles Clippers earlier this month and their argument reportedly continued in the locker room after the loss. The team then suspended Green for one game. Durant said he will not let the incident impact his impending free agency in an interview with Yahoo Sports on Tuesday. "Nah, [it won't be a factor]," Durant said. "Because at the end of the day, I'm just a ballplayer that's just trying to be in a great environment to play basketball and groom my skills every day. And I want to compete on a level that once the game starts, I'm just totally comfortable with my surroundings, with just going out there and being me." The 30-year-old said he "never really felt like" the argument with Green was a problem. But, he added he was initially "upset" after the incident. The Warriors have lost three straight games and have dropped four of their last five since the confrontation between Durant and Green. Durant, however, said the altercation could end up bringing the team closer together. "When you go through some adversity in your personal relationships and you kind of lay everything out on the table with that human, that person, you start to just really get an understanding for everything," Durant said. "I feel like we'll all do that at some point. The Warriors will return to the court on Wednesday when they face the Oklahoma City Thunder.